it has been said on more than one occasion, that the finest examples of music or visual art are those that require as much effort on the part of the spectator/audience/listener as that of the artist responsible. now of course this depends very much on what you'd define as art and whether the term music applies to the more popular variety. it's unlikely that the latter is the case for good old pop music, as by its very definition it's supposed to appeal to a majority, and i certainly don't remember breaking sweat listening to radio one or top of the pops when it appeared front and centre on a thursday eve. more likely the statement referred to cutting edge jazz such as that of john coltrane and his disciples or much of the daily output from the london sinfonietta or kronos string quartet. whether this proves to be your cup of tea is, quite frankly, between you and your itunes music library, but i am of the opinion that anything worth doing or having, ought to have at least a modicum of effort attached. for were we all to remain satisfied with the more popular items of artistic and musical endeavour, the top ten albums would probably consist of little more than take that or cheryl cole. in 1972, on the strength of the single 'virginia plain', i purchased the first roxy music album (something of a disappointment if i'm honest, because i'd laid off buying the single on the assumption it would be included on the album (it wasn't), one rather unimaginatively entitled roxy music). though the track listing held one or two catchy tunes, there were others that proved a bit of an uphill challenge, particularly the bob (medley), a track that led to a few strange glances from school friends when played on their cassette decks (remember those?). however, recalling my mother's admonition 'pride bears no pain', coupled to the fact that i had spent my hard-won pocket money, i persevered with headphones, and it is my concerted opinion that had roxy music and one or two others not been so inclined towards musical bizarreness on occasion, there are portions of contemporary music that might never have seen the light of day. should the same be required of the bicycles in our lives? well, strictly speaking, the only effort we should be guilty of is the puffing and panting necessitated by climbing an 8% in the big ring, or your own personal equivalent. but shiny stuff engenders its own requirements, and it would be tantamount to a tantrum to ignore anything that proposes just a bit more faffing about than a di2 front gear mech. 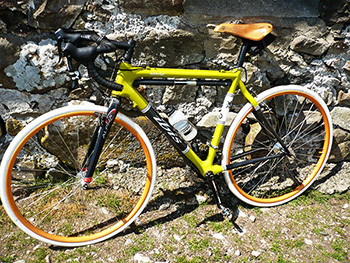 which brings me neatly to the most awesome pair of wheels it has been my pleasure to look at, let alone ride around on. beautifully and meticulously built by jude kirstein at sugar wheelworks in portland, oregon, these are not your regular pair of hoops. 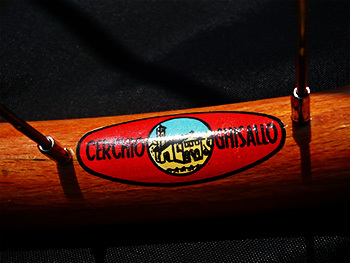 for starters, the 36 hole rims are made from italian beech wood, marketed under the ghisallo moniker and very kindly supplied by ric hjertberg of wheelfanatyk. 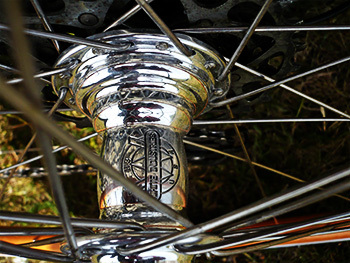 ric and his brother were the originators of the highly regarded wheelsmith brand of spokes (no connection to derek mclay of wheelworks in larbert, scotland), a selection of which he was also kind enough to supply for the build. these alone place the wheels on a pedestal, as original wheelsmith spokes are now remarkably akin to hen's teeth. 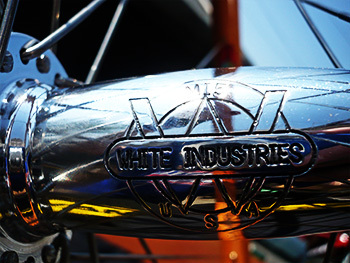 spokes and rims, however, do not a bicycle wheel make and in this instance the highly polished hubs were graciously supplied by white industries in the usa. the front mi5 hub features a 15mm steel axle, more regularly recommended for offroad riding, but according to jude it's the only white industries front hub that offers 36 spoke holes (the h2 road version tops out at 32h). the rear h3 hub can be had with shimano/sram cassette splines or campagnolo, depending on groupset. the level of gloss, shine and sparkle offered by these hubs, shows off the varnished beechwood to a sculptural level. i cannot tell a lie; my intention had been to fit these to my chris king cielo, but one or two factors rendered that a tad impractical. the rims are 29mm wide, making them a less than easy fit between regular caliper brakes, and while wearing a pair of white panaracer pasela 700 x 28c tyres, fitting beneath those fullwood fenders was going to be a major struggle, one with which i opted not to engage. thus, the only option left open was to fit them to an ibis hakkalugi cross bike, offering the unfettered luxury of trp cantilevers and currently, no mudguards. so far, so good. jude sent instructions to aid setting up the wheels after their long journey from pdx to glasgow to islay. 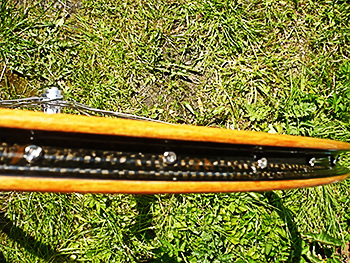 she had trued the rims to within a few millimetres both laterally and radially, but figured i ought to check in my var truing stand and to put a smidgeon more tension all round. 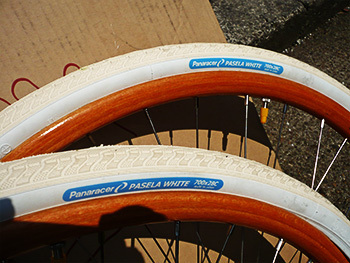 previously the ghisallo beech rims were available for only tubular tyres, the wood suffering a similar problem to that experienced by carbon at one time; sideways pressure on the rim exerted by an inflated tyre sidewall. this defect has been cured, ironically, by fitting a strip of carbon fibre in the tyre well to reinforce the wood. wood has other similarities to that of carbon in that it does not conduct heat very well, so the standard rubber pads have to be removed in favour of a set of cork pads. though the tyre sidewalls indicate a pressure of over 100psi, jude reckoned that no more than 70 ought to be inflated in this case. once installed, i had my first experience of the effort that was going to be required on my part. i had slowly taken the tyres up to 70psi in stages, then left them outside while lunch was scoffed. midway through the latter, attention was rudely arrested by a loud bang, the rear tyre having removed itself from part of the rim and blown a hole in the tube. this tyre has continued to prove a mite troublesome during the bedding-in procedure, resulting in the occasional bump, bump, bump when traversing smooth road (of which, admittedly, there are precious few kilometres on islay). the only solution so far has been to stop periodically, let some air out the tyre and attempt to re-seat the aramid beading, but in view of the ride quality of these wheels, it is but a small price to pay for the luxury and privilege of having these fitted to the ibis. i believe the cure may now be final, and have settled on 60-65psi as an agreeable inflation level. first impressions are highly subjective. i figured that 28mm tyres, inflated to only 65psi, sitting on 29mm rims were unlikely to promise a fast ride, but my temerity was misplaced, for not only can i still climb hills like the mountain goat my publicity handout says i am, but these respond to a bit of welly every bit as well as a pair of treadless 23mm race tyres. however, the part that has me seriously stumped, something that will remain the subject of a longer-term test is just how to put the experience into words. 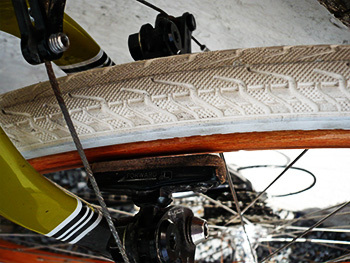 make no mistake, these wheels need more than just physical effort on behalf of the rider; initially the faff might even keep you away from an extra cappuccino. but the rewards more than justify every ounce of effort you send in their direction. they look fabulous and ride like nothing else you've ever tried. as yet, the opportunity to ride in the rain has not presented itself, but this is islay, so the chance won't be far away. toe-in on the front cantilevers is not yet perfectly set, so there's still a bit of untoward squealing under hard braking, though stopping itself is not a problem. wet varnished wood rims might not offer such a confident level of stopping in the rain, but i aim to find out. and though it may not come as much of a surprise, white tyres don't stay white for very long when you ride them, especially along the dunes on uiskentuie strand. i would like to sincerely thank ric hjertberg at wheelfanatyk for supplying the ghisallo rims and wheelsmith spokes, to white industries for the hubs and most of all, jude kirstein at sugar wheelworks for not only building such a fabulous pair of wheels, but for being excited enough for both of us.